Seriously injured patients were earlier referred to Ajmer and now have been shifted to Jaipur. 10 bodies including that of the bridegroom's mother, Ms Achuki Devi, were found today. 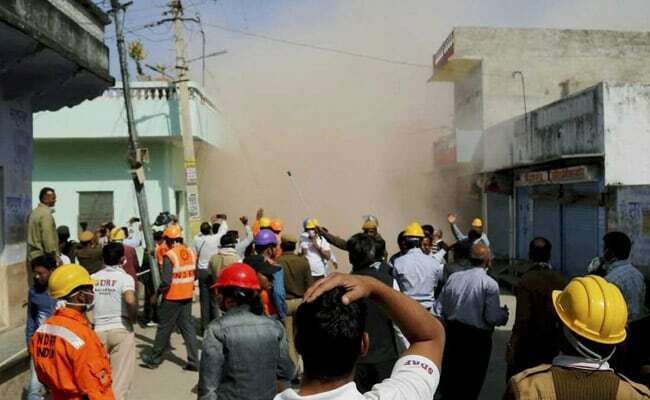 Jaipur: The number of dead in the cylinder blast in Rajasthan's Ajmer district has gone up to 19 as 10 more bodies being recovered from under the rubble on Sunday. According to official sources, all the persons, who were missing since the blast in Beawar town on Friday night, have been accounted for. However, the administration will continue with the rescue operations, involving army personnel and the national and state disaster response force personnel, till the entire rubble is removed. The twin cylinder blast on Friday night led to the collapse of a double-storey building, Kumavat Bhavan, which was hosting a pre-wedding function for Hemant Patlecha. While nine bodies were recovered on Saturday, 10 bodies including that of the bridegroom's mother, Ms Achuki Devi, were found on Sunday. The 19 dead included three children - Lakshat, 1, his brother Kartavya, 2, and Khushi Devda, 2. Some of the other deceased have been identified as Nirmala Devi, Monica, Hemlata, Basant Raj and Hitesh. Ajmer Collector Gaurav Goyal has directed officials to deal strictly that those found filling cylinders illegally. Meanwhile, Mr Patlecha, displaying strength and resilience, reached Jodhpur with a few relatives to exchange wedding vows with Ritu in a brief, low-key ceremony amid the prevailing sadness.